This is my second review of a Thymes candle. Andrea sent me their Frasier Fir candle for Christmas and I loved it so much, I placed an order right after I burned and reviewed it. I admit, I don’t purchase luxury candles as often as I would like… I have a hard time spending so much for one candle. I do want to review more luxury brands so I just need to get over it and I am working on it, hence, my Thymes order!! I only purchased a few fragrances to start out and one of the scents was Blue Spruce & Elderberry. It was on sale and still is by the way (hint hint.) It sounded intriguing, plus at $16.00, it was a great deal. The style of my candle was very simple yet elegant. The glass vessel was a dark amber. The wax a caramel brown with one centered wick. Wrapped around the center of the candle was leather twine tied with a decorative white charm. Very nice!! The box it came in is just as pretty. A rich dark brown with a wood grain design embossed throughout the box. The front of the box showed a metallic bronze tree in bloom with the scent name in teal directly below it. See picture above for visual reference. Hmmm, I wasn’t so sure about this one. My nose wasn’t detecting anything in that scent description. When I first smelled it, it seemed really perfumy… a scent that reminded me of a strong and overly scented soap. I could already tell (right off the bat) my husband was going to **really** dislike this candle. I’m already laughing just thinking about it – poor guy. Time to put my theory to the test and light this candle up… and let the fun begin!! My room of choice to test candles in is my master bedroom so that’s where this candle went. It didn’t take long to start noticing the fragrance, not even 5 minutes in… the scent itself, very hard to describe… I still say it smelled like an expensive soap… it smelled very clean and fresh but still too perfumy for my taste. I didn’t love this fragrance but I didn’t dislike it either, it was just one of those scents that’s hard to explain. My poor husband…. the moment he smelled it, he voiced his dislike immediately. LOL! After a good 3 hours of him being home, he finally begged me to let him blow it out. I asked him what he thought of it since I’m always curious to get his opinion and he surprised me by saying “Desert Sage” – it smelled like burning desert sage mixed with perfume. Where he came up with that, I have no idea. So as I predicted… this was *not* a husband approved scent. In closing, I personally didn’t think it was too bad. It was fresh and different. It was also SUPER strong… on a scale of 1 to 10, this fragrance was a 12. It filled up my bedroom, master bathroom and traveled beyond into my great room with fragrance. Very strong candle. My candle burned perfect. No wick issues, full melt pools and no wasted wax. Very nice! This was a weird candle for me because although I didn’t love this scent, I didn’t hate it either. It was just really different and not a fragrance I’m used to burning. Would I purchase it again? Probably not… but I would recommend it to those who love fresh and unique fragrances. This is just one of those candles you have to experience for yourself. And if you want to try it… you better hurry. It’s clearance on Thymes website so I think it’s going – going – gone soon. Even though I wasn‘t crazy about this candle, I‘m still rating it high because it met all the criteria to warrant it. Presentation was awesome, it burned perfect and the strength was out of this world. I just personally didn‘t care for the fragrance. Have you tried Blue Spruce & Elderberry from Thymes? Review it with us. In the comment section below, review and star rate your experience… it’s easy! 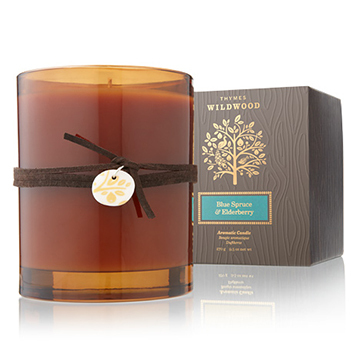 Scent description for Blue Spruce & Elderberry - With the invigorating freshness of forest air, this scented candle casts a crisp chill of woods warmed by sparkling herbs and exotic spices throughout your surroundings.